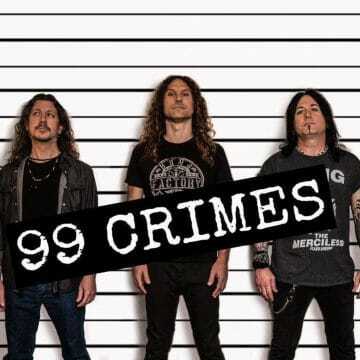 99 CRIMES CONSISTING OF DANGEROUS TOYS AND EX-DIRTY LOOKS GUITARIST PAUL LIDEL ON LEAD VOCALS AND GUITAR, JEFF LYNN ON BASS AND CHRIS JORDAN ON DRUMS, ARE ABOUT TO RELEASE THEIR DEBUT FULL-LENGTH SELF-TITLED ALBUM VIA PERRIS RECORDS ON APRIL 5, 2019. ALMOST SIX MONTHS AGO, SLEAZE ROXX INTERVIEWED LIDEL WHO SPOKE OF THE BAND’S DEBUT EP, WHICH WAS RELEASED IN EARLY 2018 AND CONSISTED OF FIVE SONGS. SLEAZE ROXX CAUGHT UP WITH LIDEL TO FIND OUT ABOUT 99 CRIMES’ UPCOMING NEW ALBUM, GET AN UPDATE ON DANGEROUS TOYS’ UPCOMING NEW STUDIO ALBUM AND DISCUSS LIDEL’S TIME IN DIRTY LOOKS. YOU CAN ORDER 99 CRIMES’ FULL-LENGTH ALBUM DIRECTLY FROM PERRIS RECORDS. 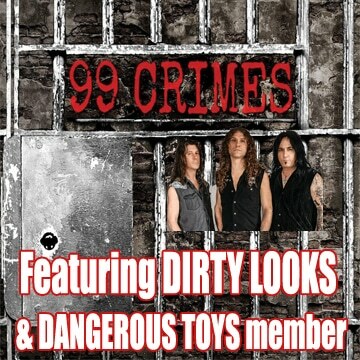 Sleaze Roxx: 99 Crimes’ debut full-length album is about to be released. How long did it take to record the album? Paul Lidel: We spent a total of nine days making the album. We had been playing almost all of the songs live so we had them together pretty well by the time we got in the studio. One of the songs however, was written at the last minute, and although we had not yet played it live, we decided it needed to be on there. That song is called “Move Like That.” We’ve been playing it live and it goes over really well, so I think we made the right call. Sleaze Roxx: I can’t wait to hear that one in particular! You released a five song EP last year. If I recall correctly, those five songs will be part of the debut full-length album. Why did you decide to include those tracks on the full-length album? 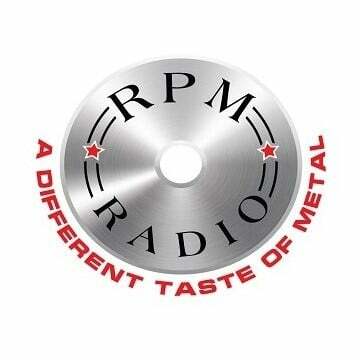 Paul Lidel: Our label, Perris Records, said that they could do more with a full-length album as opposed to our EP. Since only a couple hundred copies of the EP were made, our label suggested that we record six more songs, add the songs that we had already recorded, and release it as our full-length debut album. Sleaze R0xx: [Laughs] That means your EP is like a collector’s item! Jeff Lynn handled the lead vocals on one of the songs on the EP. Is he handling lead vocals on any other songs on the full-length album and how do you choose who sings lead on what songs? Paul Lidel: The song on the EP that Jeff sings lead on [“Avenue”] is also on the album. He had written it several years ago and when he played it for me one day, I insisted that we play it and that he sing it. We have other songs in the works, which will feature him on vocals, but I do the lead vocals on the remaining songs on the album. 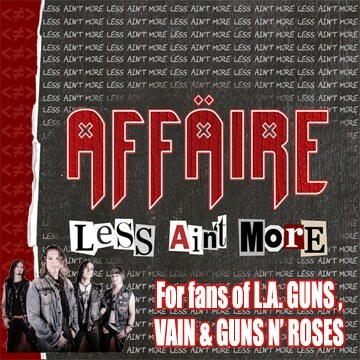 Sleaze Roxx: How did you guys come up with the idea for the album cover? Paul Lidel: The album cover was inspired by a piece of art made by my girlfriend, which has the band’s logo behind bars. The guys suggested that we use that idea for the album cover. We shot the video for the song “Coming Down Like Rain” in an old jail house so that goes along with that same idea. Sleaze Roxx: You’ve been in association with Perris Records over a long period of time. What makes them the record label of choice for your band projects? Paul Lidel: Perris Records has always treated me and my bands very well. We have known each other for many years and that helps things go smoothly. Also they do a good job of getting behind the band. Some bands on bigger labels fall into the situation where the band is not a priority so the label doesn’t do much to promote the band. Also, Perris Records has always given my bands complete artistic control. I feel it’s important for the band to make the decisions on what songs to record, etc. I’ve been on major labels before and had them influence song choices and other decisions. Sleaze Roxx: Tell me something about your bandmates that people would not know about them. 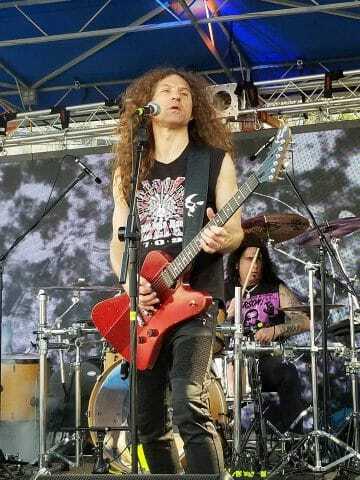 Paul Lidel: Chris has played in several touring bands among them are Miss Crazy and Velvet Revolution. When Chris was in high school, he was a soccer player and even turned down a college soccer scholarship, and chose to go on tour with his band instead. In addition to being a fan of old school metal and rock, Chris in also a big Elvis Presley fan. Jeff played in his first bands while he was in the military. He taught himself to play bass by learning Rush and Iron Maiden songs on an acoustic guitar that he made into a bass. He learns amazingly quickly, and can play just about any style of music. Sleaze Roxx: What about yourself? What is something that people would not know about you? Paul Lidel: I guess not many people know that I play keyboards. I’ve played keys in blues, rock, country, southern rock, and jazz bands, in addition to studio session work. I don’t play any keys on this album though. I started off as a drummer at age nine and was the drummer in bands in junior high school. I started playing guitar at age 10, and learned to play by listening to records and also from the guitarists that were in the bands that I played drums in. Sleaze Roxx: Where is Dangerous Toys at in terms of the recording and release of their new studio album? Paul Lidel: We have a handful of killer songs written. We plan to play some of them at our upcoming shows! It’s been a long time since we’ve played any new songs live. I’m really excited! We have lots of song ideas and have been getting together to write. Everyone lives far apart, so it makes it difficult to get together, but we’ve been making it happen. So we hope to get in the studio pretty soon and start work on a new album. 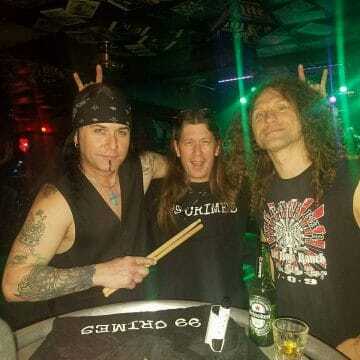 Sleaze Roxx: Are you planning any touring outside the Texas area with 99 Crimes? Paul Lidel: Yes. We have tentative east coast dates that should be firming up in the next week or so. I anticipate playing outside of Texas quite a bit in the coming year. We also have our sights set on playing overseas as well. Sleaze Roxx: You had two stints in Dirty Looks. What brought you back in the band in 2007 and why didn’t you stay that long the second time around? 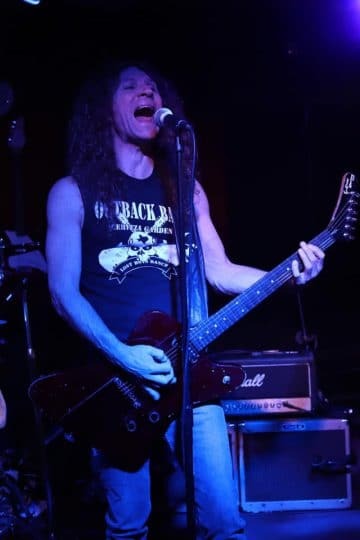 Paul Lidel: After Dirty Looks broke up in late ’93, I was offered to move to Texas to play with Dangerous Toys, who happened to be my favorite band. In 2007, Henrik [Ostergad] invited me to play on some of the songs on the ‘Gasoline’ album, and even included a couple of my songs on it. I recorded my tracks in Austin, so we never really got together, and I hadn’t seen Henrik for over 10 years. The following album ‘Super Deluxe’ was done the same way. I recorded my tracks here in Austin but on that one, I played on all of the songs. I have fond memories of that album, spending time on the phone with Henrik, and laughing like we hadn’t done in many years. Sleaze Roxx: Did you stay in touch with Henrik after your last departure from Dirty Looks and were you surprised that he passed away in 2011? Paul Lidel: Yes, after the ‘Super Deluxe’ album, we talked from time to time. The last time I spoke with him, he was aware that his time was short. I’m really glad that we were on such good terms when he passed. He was a very special and unique guy. There will never be anyone else like him. We were often roommates both on and off the road, and there was a time when it was just him and I in the band. As a matter of fact, the song “Blue Tequila” among and some others, were written with me on the drums because we were between drummers at the time. Sleaze Roxx: Which one is your favorite Dirty Looks album that you were a part of and why? Paul Lidel: I’d have to say ‘Cool From The Wire.’ At that point, everything was so new and exciting. Working with Max Norman who produced the Ozzy albums with Randy Rhoads, and many other legends was a thrill to say the least. The album was recorded on two inch tape, and I recall cringing when Max would make an edit by actually cutting the tape and then taping it back together! We recorded the album in the Carriage House in Stanford, Connecticut. We lived there for a month while we recorded. Another band, Fates Warning was also recording an album there at the same time. We had a blast hanging out with them. 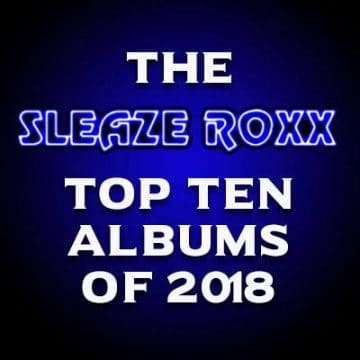 Sleaze Roxx: Which one is your least favorite and why? Paul Lidel: Of all the Dirty Looks albums that I played on — ‘Cool From The Wire’ , ‘Turn of The Screw’ , ‘Bootlegs’ . ‘Five Easy Pieces’ , ‘One Bad Leg’ , ‘Chewing On The Bit’ , ‘Gasoline’  where I only played on the last two songs, which I co-wrote with Henrik, and ‘Super Deluxe’ , I guess my least favorite would be ‘One Bad Leg’ which was released in 1994, the same year that I joined Dangerous Toys. I feel the least connected to that one because some of the songs were only meant to be demos. For some of the songs, Henrik and I went to Erie, Pennsylvania [USA} for a week or so, and recorded with a drummer and bass player that I didn’t really know. By the way, I am credited with playing guitar on the album ‘Rip It Out!’  but I didn’t play on that one. Sleaze Roxx: When 99 Crimes play live, do you ever throw Dangerous Toys and/or Dirty Looks tracks into the set, and why or why not? Paul Lidel: To this point, 99 Crimes has not performed songs by any other bands. 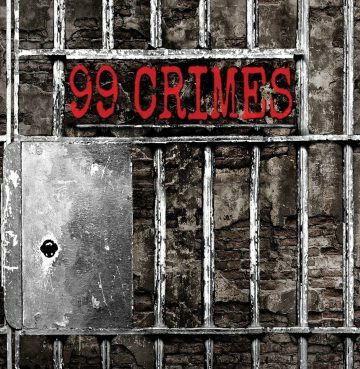 We prefer to stick to 99 Crimes songs, although we are always checking out cover songs that might be cool to remake. We have performed 26 different original songs so far and are constantly writing more. DaveTV.org presents 99 CRIMES “Devil In My Dreams” on DaveTV #170 September 30, 2018 https://www.facebook.com/99crimes/ Please credit Dave Prewitt / DaveTV.org with any use of the video. If you wanna support the cause, our Venmo is to capzeyez@yahoo.com and paypal is here: https://www.paypal.me/davetv No copyright infringement intended, I do not own the content in this video. You can order 99 Crimes‘ debut full-length self-titled album directly from Perris Records.